Then in July a young broker named Charles Vansant went swimming off a New Jersey beach, had his left leg taken off by a shark with a single bite, and died almost immediately after being pulled from the water. It’s an arresting way to open a book about pandemics but not a misleading one. 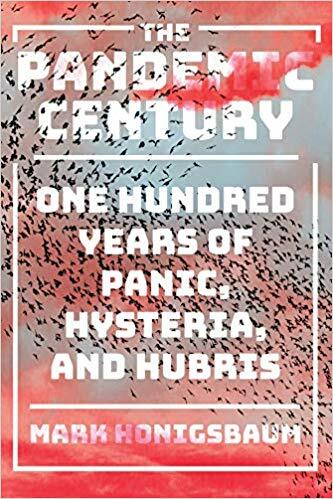 As Honigsbaum makes clear throughout The Pandemic Century, unwarranted certainty has been an ankle-weight slowing research and response to possible pandemics throughout the twentieth century. How easily can viruses leap from species to species? How likely is it that a disease previously confined to some small and remote area might find its way to a nearby big city, much less a big city on the other side of the planet? How simple a matter would it be to educate the locals at ground zero of any such viral outbreak? Unwarranted certainty has attended each of these questions, hence the “hubris” in Honigsbaum’s title. The book is unfailingly fascinating reading, despite its appalling subject matter. The author dramatizes epidemics like Ebola or Zika and draws vivid portraits of many of the people at the front lines of those epidemics, and the emphasis is always on the tension, the race between knowing enough and doing enough. Many of the stories can be maddening, as when a faith healer named Finda Mendinor in Sierra Leone, who’d gained a reputation among the local villagers for her claims of being able to cure ebola, inevitably died of the disease. Dozens and dozens of people flocked to her funeral rites and kissed her corpse - thus enormously spreading the disease. Honigsbaum spends a good deal of time crafting an account of “parrot fever,” the outbreak of psittacosis that spread in the US in the 1930s, pointing out that although the spread of the disease was arrested by the development of specially-designed feed distributed for use by bird breeders, complacency re-grows like shrubbery. “Unfortunately, today, as in the 1930s, some breeders refuse to believe their aviaries are latently infected,” he writes. “Instead, they dilute the seed or fail to administer the full course of antibiotics, resulting in the persistence of subclinical infections of psittacosis in domestic bird flocks.” It doesn’t take much effort to imagine what the worst results of such carelessness might be. Tens of millions of us annually make such trips in aircraft either for business or pleasure, and as flights become cheaper and passengers make more and more journeys, the risks are only likely to grow. Herded into airline waiting rooms, then crammed into economy row seats, we resemble nothing so much as the captive Amazonian parakeets who introduced psittacosis to Baltimore and other US cities in 1929. The difference is that the parakeets had no choice about their accommodation, whereas we do. As the environmental historian Alfred Crosby put it, international jet travel is like “sitting in the waiting room of an enormous clinic, elbow to elbow with the sick of the world.” Yet budget airlines continue to grow in popularity. The Pandemic Century shows very similar patterns recurring again and again whenever a new pandemic has threatened in the last century, and its implicit advice ought to be heeded. The flashes of potential disasters, outbreaks that catch a brief round of headlines and then fade from the collective attention span, flicker like warning lights throughout Honigsbaum’s book. Readers frightened half out of their wits by what they’ve read will be universally hoping the right people are heeding those warnings.